Council members gathered today to celebrate the administration's February 2019 plenary assembly. Unanimous support was given to a preliminary proposal to record and broadcast plenary sessions. Councillor of the president's office, tax office and rural affairs, Bartomeu Escandell, said any islander with an internet connection would now be able to follow the administration's plenary gatherings. Retransmission of today's session was available for online viewing on the Formentera Council's YouTube channel. Omar Juan Moreno announced he would step down from his role as councillor. CiF president Jaume Ferrer thanked Juan for his work over the previous four years. 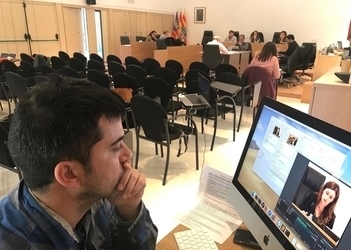 The message was echoed by Juan's colleague, Compromís representative Cristina Costa, who described the move as “understandable in light of my colleague's personal situation”. Assembly members were united in backing final approval of the strategic funding roadmap for 2019. Escandell noted the plan sets aside more than €1.5 million to promote direct participation and involvement in associations, as well as improvements in local heritage and culture and other measures. The money will go to social action causes like equality; the fight to end gender violence; youth; involvement in associations; local participation; special needs groups; associations for the elderly; education; culture; heritage; trade and sport. A measure to back the administration's 2017 bookkeeping passed thanks to the “yes” votes of Gent per Formentera and Socialist councillors (and despite abstention from their colleagues of the People's Party and Compromís). As per procedure, the vote marked the final step before the figures are submitted to the “Court of Auditors” (Sindicatura de Comptes). Councillors came together to support the underpinnings of a partnership with the local farmers' co-operative (Cooperativa del Camp) to allocate up to €115,000 in annual funding to promote primary economic activity on the island. Councillor Escandell applauded the co-operative's efforts, including creating the chance for owners of farmable land to turn it over free of charge “so it can be preserved and our island's traditional natural beauty improved—all while upholding sustainable agricultural practices”. The session also came with unanimous backing for initial approval of operations and use guidelines for the la Mola lighthouse facilities that the Balearic port authority has lent to the Formentera Council. Assembly members likewise gave the green light to two measures brokered with cross-party support. One entails requesting a Guardia Civil maritime services vessel and a maritime rescue vessel be based on Formentera. The councillor of the president's office described the services as increasingly necessary given the surging maritime traffic around Formentera and because, in Escandell's words, “the fact we are the southernmost island in the Balearics and the preponderance of sea traffic in summer mean Formentera's location is advantageous”. The second proposal to obtain the go-ahead involves underlining the need to securely cover wells and other dangerous holes on the surface of the island. Environment councillor Daisee Aguilera said the move would mean petitioning the Govern's directorate general of water resources, the authority with jurisdiction over such matters, “to oversee a revision of authorised and unauthorised wells to ensure they are legally compliant, thus safeguarding against accidents”. The proposal means asking the directorate general to apply measures to recover Formentera's body of water. “This water body is chiefly salinized”, said Aguilera, “and there is currently no measure in the Balearic Islands' water plan to recover it”. Before the day's session was complete cross-party support had also come for a Compromís proposal to streamline renewable energy measures. Councillors voted wholesale to create a dedicated position within the CiF land office to facilitate such efforts, given that, as mentioned in the proposal, available funding from the Govern comes with “fairly strict” conditions and deadlines. -Partnership with Palma's directorate general of sport to support values strategy. €12,500. -Partnership with Fundació per a l'Esport Balear to promote local competitions, sponsorships, professional training, fitness and women. €100,000. -Sponsorships to organise fixtures like the half-marathon, triathlon and the AETIB's Volta cicloturista for cyclists. €75,000. -Private sponsorships for local schools. €18,000. -Sponsorships and backers for the half-marathon. €20,000. “Taken together that's €225,500, but we'll continue working to improve the situation for our local athletes and guarantee top-class organisation of local competitions”, said Vidal. Vidal pointed to the “already complete, soon to be operational, new and highly anticipated 'Nautical Sport Centre of Formentera'”, predicting it would be the “vehicle for connecting the island and its visitors to the sea”. Among his department's other efforts, Vidal also highlighted the “Values Plan” (Pla Valors), the strategic funding roadmap for sport, the crucial role of municipal fitness schools, and a new sport gala.